Last month, scientists from GLERL, the Cooperative Institute for Limnology and Ecosystems Research (CILER), and other university partners took the research vessel Laurentian for a multi-day cruise on Lake Michigan as part of seasonal sampling to assess the spatial organization of the lower food web—spatial organization simply means the vertical and horizontal location where organisms hang out at different times of day, and the lower food web refers to small organisms at the bottom of the food chain. The research goes on around the clock. Scientists work in shifts, taking turns sleeping and sampling. 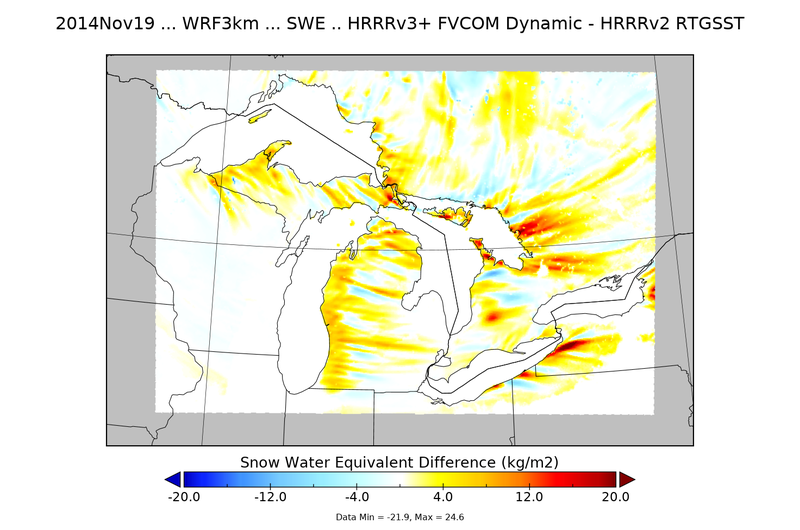 The Laurentian spends a full 24 hours at each monitoring station, sampling vertical slices of the water column. Sampling at these same stations has been going on since 2010, providing a long-term dataset that is essential for studying the impact of things like climate change and the establishment of invasive species. 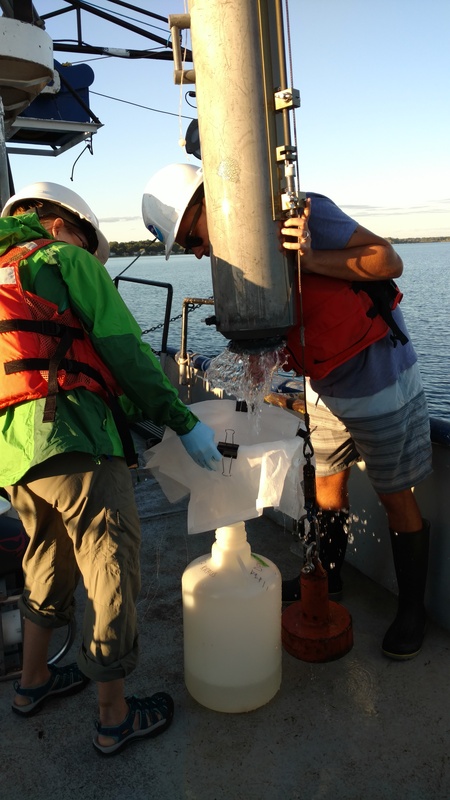 Sampling focuses on planktonic (floating) organisms such as bacteria, phytoplankton (tiny plants), zooplankton (tiny animals), and larval fishes which feed on zooplankton. Many of the zooplankton migrate down into deep, dark, cold layers of the water column during the day to escape predators such as fish and other zooplankton. They return unseen to warm surface waters at night to feed on abundant phytoplankton. Knowing where everything is and who eats whom is important for understanding the system. 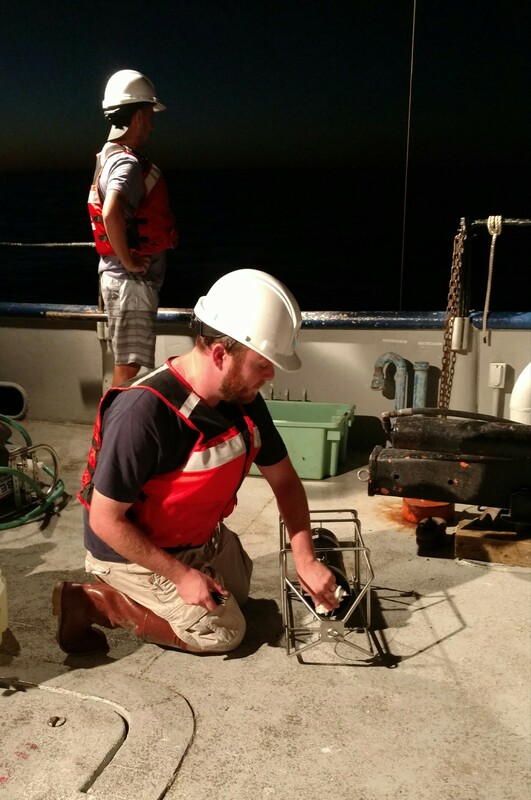 Our researchers use different sampling tools to study life at different scales. For example, our MOCNESS (Multiple Opening Closing Net Environmental Sampling System) is pretty good at catching larger organisms like larval fish, Mysis (opossum shrimp), and the like. The MOCNESS has a strobe flash system that stuns the organisms, making it easier to bring them into its multiple nets. 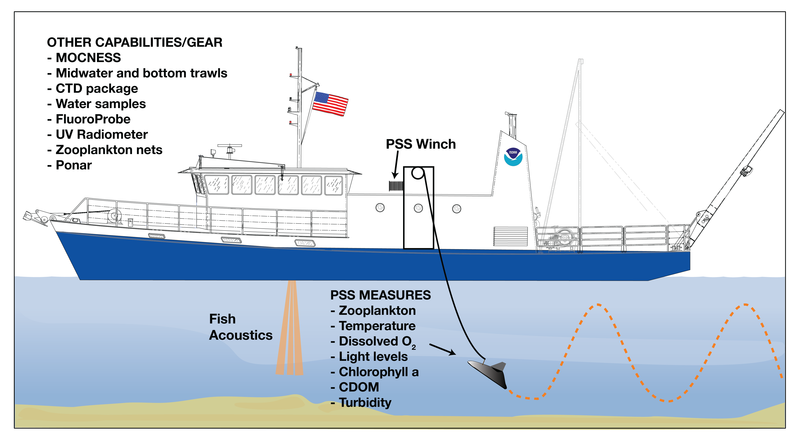 The PSS (Plankton Survey System) is a submersible V-Fin (vehicle for instrumentation) that is dragged behind the boat and measures zooplankton, chlorophyll (a measure of phytoplankton), dissolved oxygen, temperature, and light levels. 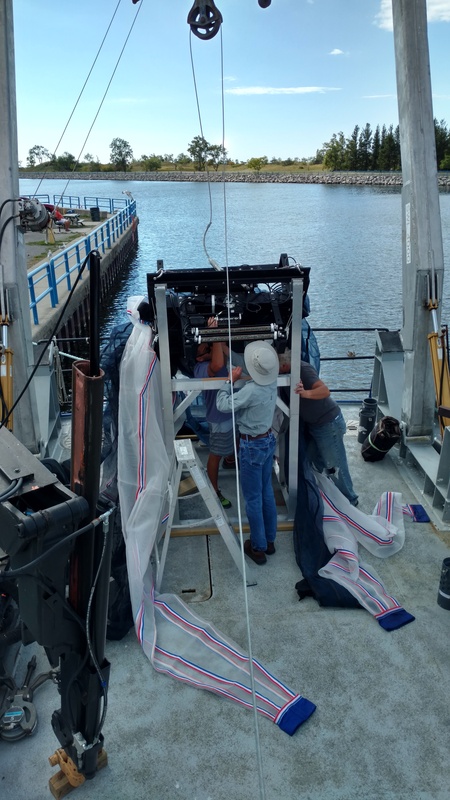 Measurements are made at a very high spatial resolution from the top to the bottom of the water. At the same time fishery acoustics show where the fish are. Together, these two techniques allow us to see where much of the food web is located. The RV Laurentian is equipped with multiple systems for studying lake life. 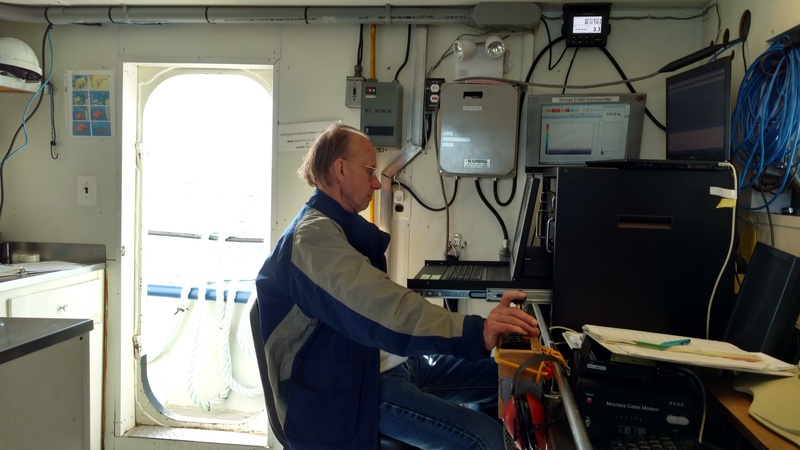 Water samples are taken at various depths and analyzed right on the boat. 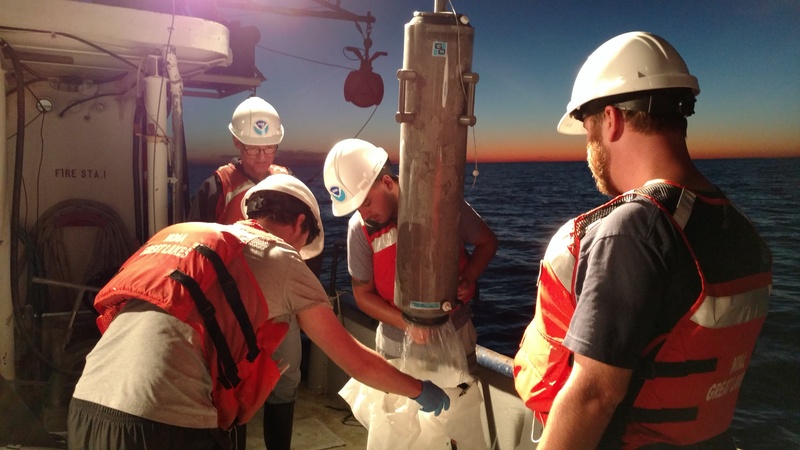 This is a good way to study microbes such as bacteria and very small phytoplankton. The lower food web has been pretty heavily altered by the grazing of quagga and zebra mussels. Specifically, the microbial food web (consisting of microbes such as bacteria and very small phytoplankton) makes up a larger component of the food web than before mussel invasion, and scientists are working to find out exactly how this has happened. Check out the photos below for a glimpse of life in the field! 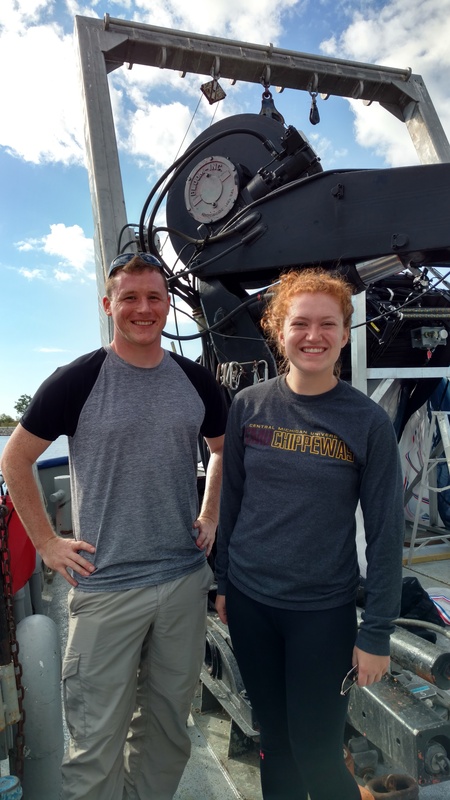 Central Michigan University students Anthony and Allie are all smiles as they prepare to head out! Chief scientist Hank Vanderploeg looks at some data. Filtering a water sample—filtering out the big stuff makes it easier to see microbes. Taking a water sample in the presence of a beautiful sunset! Categories: Research | Tags: food web, lake michigan, Research, sampling, Spatial Analysis | Permalink.